Undescover Patagonia - In El Maitenal, there's enough rock for everyone! Rock climbing in Patagonia is a treat for anyone who enjoys this sport, one of the most intimate ways to connect with nature. And at the end of the day, get ready to enjoy a cold, home-brewed beer, a Patagonian asado and great conversation amongst other climbers once you?ve completed your day of climbing. Activity Type: Rock climbing on dense, compact, conglomerate rock with many types of diverse holds, including crimps and pockets. All routes are a single pitch in length. Distance: From Coyhaique, it’s approximately 125 km. From Puerto Ingeniero Ibáñez, the farm is approximately 12 km. Duration: 1 day or however long you’d like to stay! Season: Year-round, depending on the weather. The best months are September – May. Special Considerations: The majority of the routes have new bolts and chains, with single pitches no more than 20 meters. The central area of the farm is located approximately 10 minutes from the climbing area. Contact El Maitenal to reserve your spot: Gerald Dallman (09) 83892832. Aventura Tehuelche – Coyhaique: Pimpinela 723; (09) 84118736; aventuratehuelche@gmail.com; www.aventuratehuelche.cl. Aventuraysen – Coyhaique: Road to El Claro s/n; Km 8; (09) 51193731; kabirbardi@hotmail.com; www.aventuraysen.com. Rumbo Patagón Limitada – Coyhaique: Camino Coyhaique Alto s/n, Km 10; (067) 2219710; (09) 99985637; info@rumbopatagon.com; www.coyhaiqueriverlodge.com. Marco Becerra, Coyhaique: Lautaro 798; (09)88251788; totekin7@gmail.com. Valeska Formantel, Coyhaique: Lautaro 798; (09) 91239376; vale.formantel@hotmail.com. Lilian Henríquez and Gerard Dallman are a Chilean-German couple who arrived in the area with the desire to begin a new life based on sustainable tourism. This is what led them to build their climbing center, equipped with more than 40 climbing routes on the rock walls that surround their farm. With the amount of routes and the hospitality of Lili and Gerard, this awesome refuge for climbers is not to be missed. Some of the visitors to El Maitenal are experts looking to set new routes; others are recently joining the climbing world, but all agree that the feeling of reaching the top and taking a look around at the incredible panorama of forests, mountains, the Patagonian steppe, and the Levicán Peninsula, is almost indescribable. 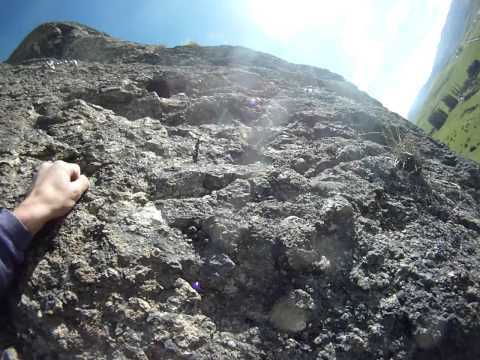 Many climbers return to explore new routes, proclaiming that El Maitenal has created one of the best equipped climbing areas in all of Aysén. The routes vary in difficulty, ranging from grades 5.7 and .12c, so be assured, there is a sufficient challenge for climbers of all levels. 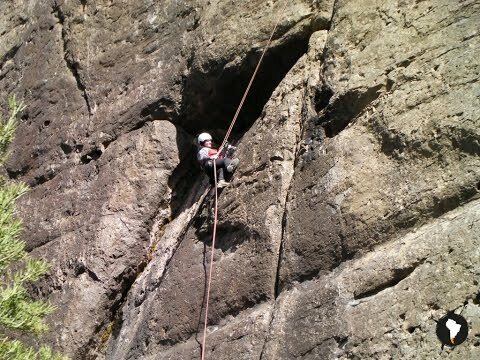 There are 30 to 35 set single pitch routes, with lengths not exceeding more than 20 meters or 9 bolts. Gerard and Lili have a file of each route’s topo that continues to grow with the addition of new challenges in this recently discovered climber’s paradise in Patagonia. To get there from Coyhaique, you need to take the Carretera Austral south and bear left towards Puerto Ingeniero Ibáñez. Travel approximately 115 km, until you reach the intersection for the Levicán Peninsula, (2 km before the center of town). From this intersection, go 5 km and STOP (briefly), because you’ll find yourself face to face with the Salto de Ibáñez, where the Ibáñez River powers its way through boulders, creating a huge waterfall that drops into two tributaries. Once you’re finished with your photo break, continue along this route for two kilometers more to the intersection for the Claro Las Ardillas Sector (right) and the Levicán Peninsula (left). Head left toward Levicán and in another 3 km, turn right into the El Maitenal Farm. The second gate is well marked with the name of the farm indicating that you’ve finally arrived at Lili and Gerard’s place. You can also take public transportation: Head to the bus terminal in Coyhaique, located on the corner of Magallanes and Lautaro, where you’ll find buses leaving regularly for Puerto Ingeniero Ibáñez. If you contact Gerard prior to leaving, you can arrange for him to pick you up when you arrive in Puerto Ingeniero Ibáñez (for a fee). We highly recommend arranging to have an asado al palo and some home-brewed beers, at the end of the day – Gerard’s beer, Dallman, is prepared using a recipe straight from Germany! If you need climbing o adventure gear, check out Suray Montaña in Coyhaique, Calle Prat #269; (67) 2234088; info.suraymontana@gmail.com. In El Maitenal, thereâ€™s enough rock for everyone!